The Back Attack Pack is deployed by a ripcord attached to the front of the backpack, somewhat like a parachute ripcord. It may sound contradictory, but the people taking the biggest risks are usually the most safety conscious. Take Billy Lucas, for example. For 30 years the 57-year-old former Marine has been a Hollywood stuntman — part of that acting as Arnold Schwarzenegger’s stunt double in films like “True Lies” and “The Terminator” series of films. 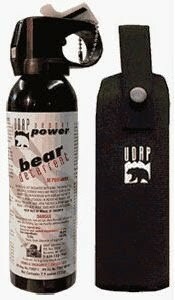 So the fact that Lucas brainstormed a design for a new way to deploy bear spray from a backpack actually makes sense. He is very aware of ways to mitigate danger. And stuntmen who get hurt aren’t going to be available to work, so there’s a monetary incentive for them to be careful. Knowing this, it’s a natural progression to the story Lucas tells about one day reading a newspaper story about a man being mauled to death by a bear and wondering if there isn’t a better way to deter attacks. Lucas had recently made the move to Livingston from Los Angeles when the incident occurred. Then he had his own encounter with a bear while fishing with friends and admitted to being spooked. So Lucas read up on other bear attacks and noticed that when people dropped into defensive positions — lying face-down and covering their necks — they were still very vulnerable. Lucas said the idea of a reserve parachute gave him the idea of a backpack-based bear spray canister that could be discharged much like pulling the ripcord on a parachute. “I had a brainstorm and put my money where my mouth was,” he said, paying an engineer to design the first prototype out of aluminum before deciding that was too heavy and going to plastic. He said he has a couple of other inventions he’s working on as well. 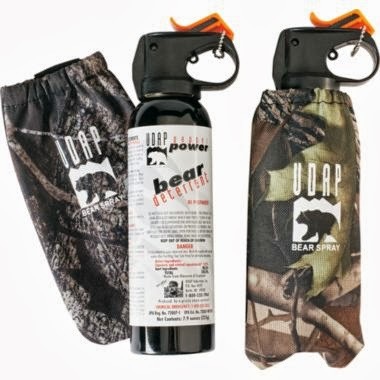 After three years in research and development, Lucas approached Butte-based bear spray makers UDAP Industries with his invention. Tim Lynch, general manager for UDAP, said it was a concept other inventors had presented to the company, but UDAP never made the jump to do its own research and development. Lucas was different. “When he showed up he had a working prototype, which the other inventors didn’t,” Lynch said. He was so impressed that he shot a video of the backpack to show the bloody face of the bear spray business to the company’s founder, Mark Matheny. 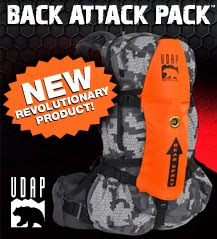 After reaching a licensing and distribution deal, last April UDAP unveiled its Back Attack Pack ($149) that can accommodate spray canisters of different sizes and be lashed on to a variety of backpacks. The backpacks are made to be a secondary or last defense — used in addition to a handheld bear spray. Lynch said he sees the device as a valuable backup for hunters — who while dressing game can be blindsided from behind by a territorial bear looking to claim a big-game kill. He said an Alaskan study showed that in the majority of bear-human encounters, the person had only 1.8 seconds to react. That’s barely enough time to pull the trigger on a bear spray canister in your hand, so a backup seems like a good idea. To view the original story in the Billings Gazette… Click here. Your first step in building a bear-smart community should be conducting a bear hazard assessment that will provide you with the information you need regarding where the bear problem is and what (species of bear) you’re dealing with. During your bear hazard assessment, you should identify potential human-bear conflicts and conflict zones, and start to think about bear control recommendations. After a hazard assessment has been completed, you should use the information gathered from the assessment to formulate and implement a bear management plan. Putting together a plan can be hard work, and will require the cooperation of multiple agencies. The plan should highlight the roles of different organizations and agencies, and how bears will be managed if they do wander into town. • Properly throwing away garbage (especially food). • Avoiding using bird feeder during bear season. • Keeping lawns and yards in tip-top shape (bears love to eat dandelions and clover). • Keeping your car clean and free from food or anything else that might smell tempting to a bear. • Securing your home by keeping windows and doors closed to prevent the smell of food from wafting outdoors. • Using a bear-proof composter. • Not using citronella (the scent attracts bears). • Washing your barbeque grill after use. • Feeding pets, and keeping pet food, indoors. • Harvesting veggies as they ripen, as vegetables like carrots in a garden will attract bears. • Thinking about using electric fencing to keep bears off of property if you have a garden, chicken coops, or fruit-bearing trees or bushes. In addition to managing properties, part of community education should include what to do while on trails and in campsites. Community members should watch out for bears while hiking, keep dogs on leaches, hike in groups rather than solo, never leave food in campgrounds, and pay attention to posted signs about bear activity. By following the tips listed above, you’ll be well on your way to establishing a bear-safe community. Visit our website for a UDAP Bear Fence or UDAP Bear Spray! Backpacking is something that millions of people all over the world enjoy. Some go backpacking for the enjoyment of nature and the ability to get out and hike on a beautiful trail. Others go backpacking for the sport of it and the ability to get in great shape. Whatever the reason, backpacking is a popular and healthy recreational activity that promotes health and encourages a respect for nature. Enjoying a hike can be done in various types of terrains and areas. It is important to have the proper backpacking equipment as well as the knowledge to navigate the area. In order to backpack safely, it’s important to have the right equipment and even the right people surrounding you. If you are new to backpacking, it is recommended to have a partner to go along with you. Sometimes, there are group hiking trips so that it can be safer for everyone involved. Having a partner that is trusted or a group of hikers to go with can ensure a safer backpacking adventure. People going backpacking for the first time often find there are some things they weren’t expecting and having someone with knowledge along for the trip can be a huge help. Once a partner or group is picked, the next step is to pick a destination. Choosing a destination can be based on factors that are important to everyone hiking. For those that are interested in certain types of terrains, there are guidebooks and magazines that can suggest various trails and give a description of the terrain. For those that are more experienced, it may be possible to choose a more challenging terrain to hike. For beginners, it is important to choose a terrain that is forgiving enough yet still carries the ability to give a challenging and fun experience. Guidebooks and magazines often have detailed reviews of hiking trails and even have maps of the entire trail. It is recommended to have a map of the hiking trail to take on a backpacking trip just in case. When choosing a destination, it is imperative to choose one that can be hiked safely in a certain amount of time. Inexperienced backpackers may want to go on a shorter trip, typically less than ten miles. More experienced backpackers may choose to hike for several days and there should be a plan to stop and relax along the way. It’s important to have all of the necessary supplies regardless of how long you plan on staying. Planning ahead is the key to having a successful backpacking trip. Supplies needed for the trip should be chosen carefully. It is important to pack enough water for the trip and calculate how much water will be needed for the planned amount of time. A map should be brought along of the hiking trail and kept in a protective cover in case of bad weather. A compass is always a handy tool to have as well. Other supplies to bring are: sun protection, flashlights, matches, first aid kits, lighters, a tent, and food. It is recommended to pack all the supplies into the backpack and practice hiking around with the weight of the full pack. This will ensure that you will have enough strength to hike with the backpack and have a successful trip.